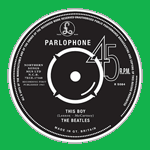 This Boy is one of the three songs performed on the Ed Sullivan Show in 1963. But the first time I heard it was when I saw David Bowie perform in Liverpool at the Top Rank Ballroom in 1972 as part of the Ziggy Stardust Tour. To celebrate 50 year anniversary of their legendary debut on 'The Ed Sullivan Show'. Feb 9 1963. 74 million tuned in on that Sunday evening, making it one of the most watched television events ever, and considered one of the most important events in music and television. In April The Beatles held all five records in The Billboard chart- Can't Buy me Love, Twist and Shout, She Loves You, I Want to Hold Your Hand and Please Please Me. A feat never repeated. Silkscreen Facsimiles of the original cardboard delivery cartons. 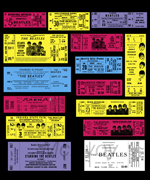 The Beatles USA is Vincent McEvoy’s 2011 original graphic edition and consists of the 15 ticket images of The Beatles final appearances in the United States before they decided to stop live performances altogether.